Will Spice Projector Phone M9000 be in Singapore? | Why You So Free Lately ? 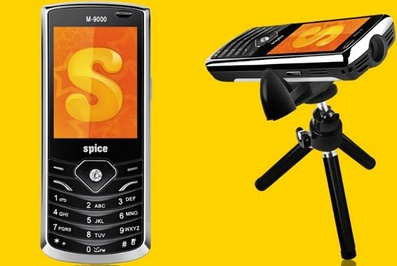 Will Spice Projector Phone M9000 be in Singapore? The next level of mobile phone technology is available right here. A handset with an in-built projector to project the phone’s content on a large screen. Now project presentations, movies, pictures or even live TV in a larger-than-life size! Now pour your heart out with the jazzy “Projector” feature in your phone. Project movies, live TV, videos, presentations or images, and enjoy life king size. Enjoy free channels on your mobile phone. Watch live action on the go! M-9000 supports Document Viewer, which enables you to view various office docs on your handset. You can view documents of MS Word, Excel, Power point and also PDF. So be the smart one. Project the office presentations and use the laser pointer to point at data or just throw it around and make everyone laugh. The phone is provided with a 3.2 MP camera, which supports the photographing and video shooting functions. Pictures are saved in the file system of the phone or the memory card. Moreover, you can view your favorite movies, as M-9000 supports major formats, including 3gp, mp4, avi, flv, rm & rmvb. With the WAP/GPRS function in M-9000, you can surf internet on your phone so that you have the power to connect to world anytime and anywhere. So what's your take on the Spice M-9000 PopKorn? Will you be getting one if it's retailing at USD200? ?